The Kaffir Lime Tree is a thorny tree with aromatic and distinctively shaped "double" leaves. The kaffir lime is a rough, green fruit. The green lime fruit is distinguished by its bumpy exterior and its small size (approx. 4 cm wide). 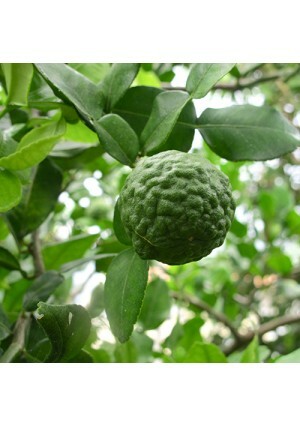 The rind of the Kaffir lime is commonly used in Lao and Thai curry paste, adding an aromatic, astringent flavor.The zest of the fruit is used in creole cuisine and to impart flavor to "arranged" rums in the Martinique, Réunion Island, and Madagascar. The leaves can be used fresh or dried and can be stored frozen. Its hourglass-shaped leaves (comprising the leaf blade plus a flattened, leaf-like leaf-stalk or petiole) are widely used in Thai and Lao cuisine (for dishes such as tom yum), and Cambodian cuisine (for the base paste "Krueng"). The leaves are used in Indonesian cuisine (especially Balinese and Javanese), for foods such as sayur asam, and are used along with Indonesian bay leaf for chicken and fish.They are also found in Malaysian and Burmese cuisines. Kaffir Limes are cold hardy in USDA Growing Zones 9-11. They can be container-grown in all other areas of the country if they are brought indoors for the winter.